Careworn. It's not what I thought. I knew it meant haggard, frayed from worry. But I thought there was another meaning, something suggested or implied. I thought it could mean when something is so deeply cared for, so cuddled and adored it becomes worn, a bit thread bare, tattered. Wasn't The Velveteen Rabbit worn from the hugs and attention, the constant play he enjoyed? I always remembered that part of the story as his having been careworn. 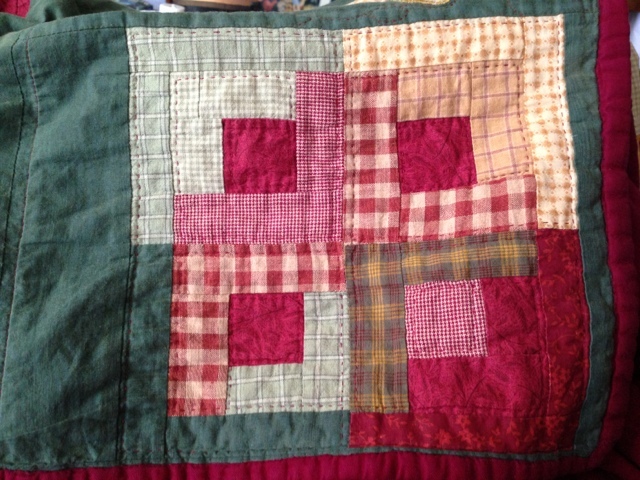 I was going to say this quilt has become careworn after a dozen years of comforting and warming us. It is just what I always wanted of this quilt. When I pieced it, I looked for older looking prints, soft fabrics, muted colors, warmth. 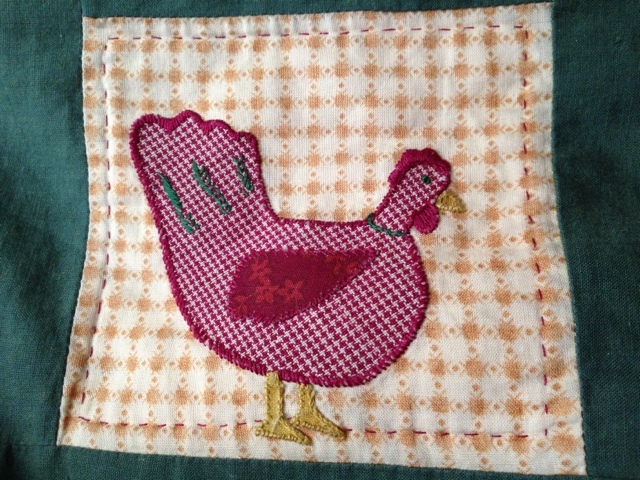 I made it a sample of different squares, with appliqués and embroidery... All familiar and meaningful images. I wanted it to be both special, and everyday... Not so special you wouldn't wrap up in it, or carry it around the yard in search of soft ground and shade. And I was looking forward to the day when I would see it in a heap, and it would look old, loved, familiar, and worn from care. Today I picked up my needle, opened my box of embroidery floss, and made many, many repairs. 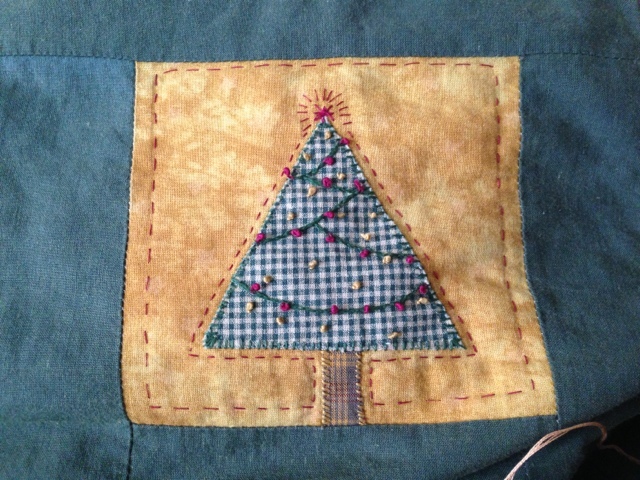 Seams were opening, and some of the appliqués were coming apart. 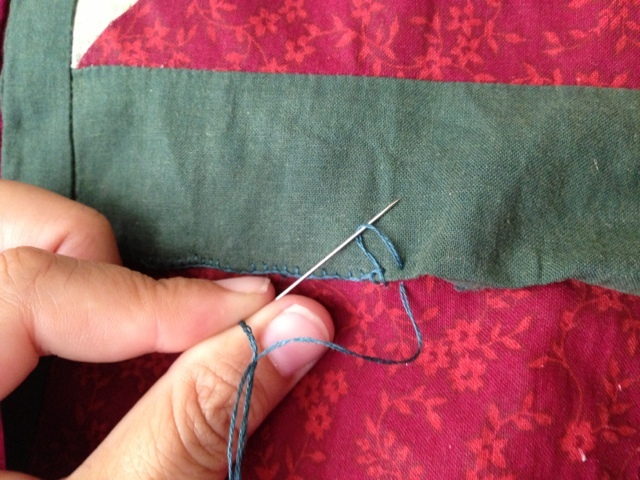 I've noticed this for some time and actually dreaded making repairs... threading needles, tying knots, figuring out how best to cope with unraveling fabrics, and broken threads. But today it was such a welcome task, I enjoyed every stitch. 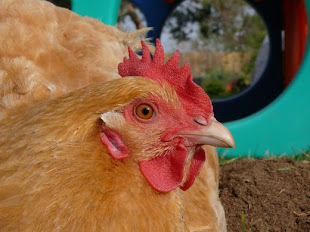 I enjoyed recalling how I chose to make a chicken, a Christmas tree, the gingham print for the cottage roof. I remembered Max suggesting motifs. He was only four years old at the time. For some reason I did not mind switching thread colors... I only used two. 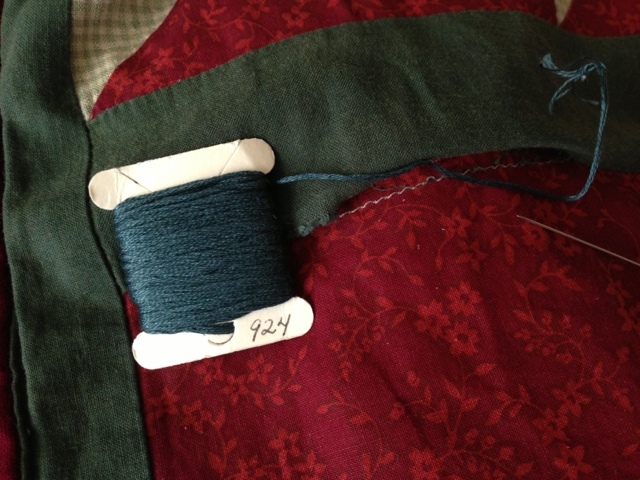 I didn't feel frustrated about finishing off one seam, starting another. It was all quite satisfying. I feel deeply thankful... for the skills I've learned, for the tools I have, for the children around me, for Geoff's insistence that I should enjoy doing happy things. I imagined someone dropping by, an unexpected knock at the door, and the little dread I would feel when they saw the clean clothes heaped on the sofa, or notice I still have not cleared dishes from lunch. I decided, this time, I was doing what really matters. This time I was taking care of something good and necessary. 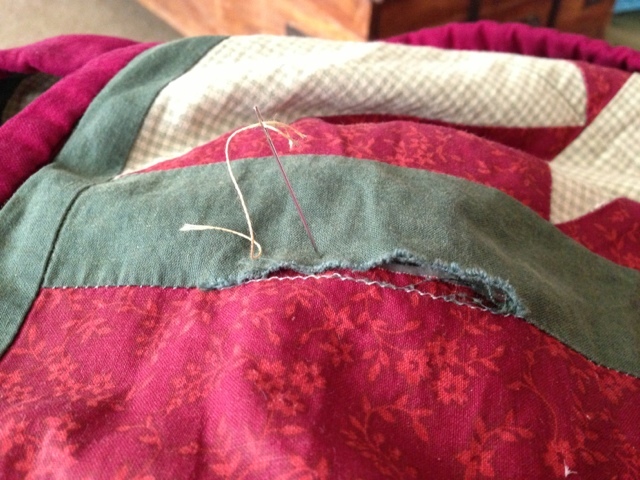 After all, a worn and cared for quilt cannot repair itself. And no matter how many socks need matching, or whatever such chore is lurking, there is not much chance of doing two, or three things at once. I might just as well enjoy this most necessary duty. 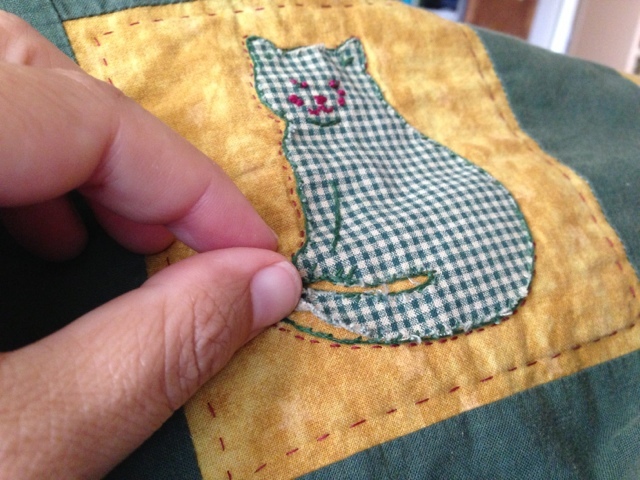 I love the quilt and your needlework! Love, love, love it! 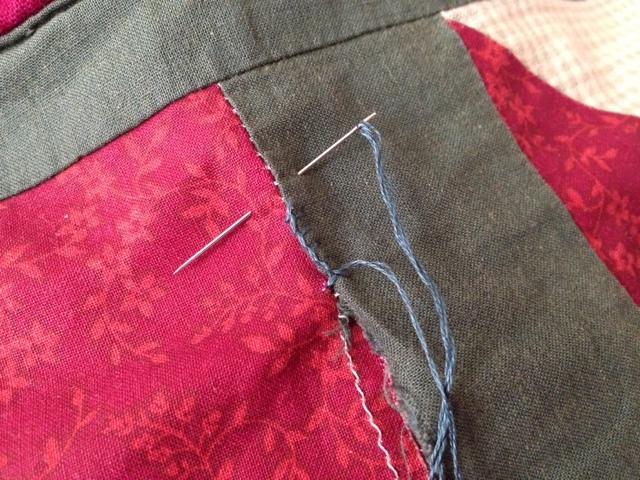 I enjoy repairing old fabric things, but I'm not as good as you at the stitching. Thank you for the compliment, Judy. 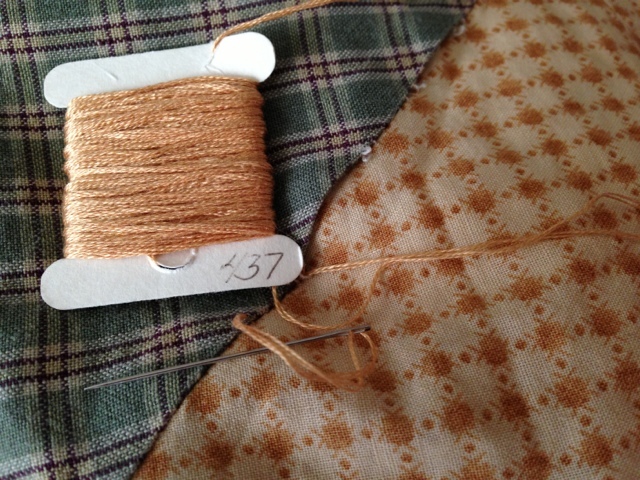 I've long wished to be a skilled seamstress and quilter, with the patience to make nice and tidy stitches. It always surprises me to realize how much I enjoy hand sewing. One admission: I broke down and bought some reading glasses. I am not sure how much or often I need them, but sometimes I am squinting to thread that needle! We'll see if they help. 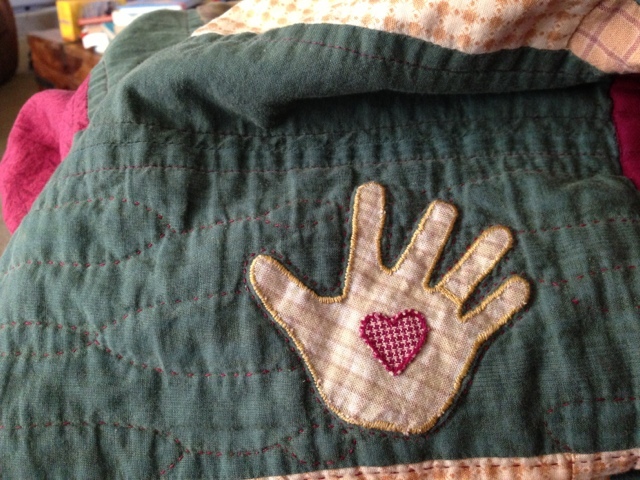 It's a most beautiful quilt and clearly made and repaired with such love. I think you are a super sticher - glasses or no glasses! I struggle to thread a needle even with glasses and have never, ever managed to sew anything I was proud of. 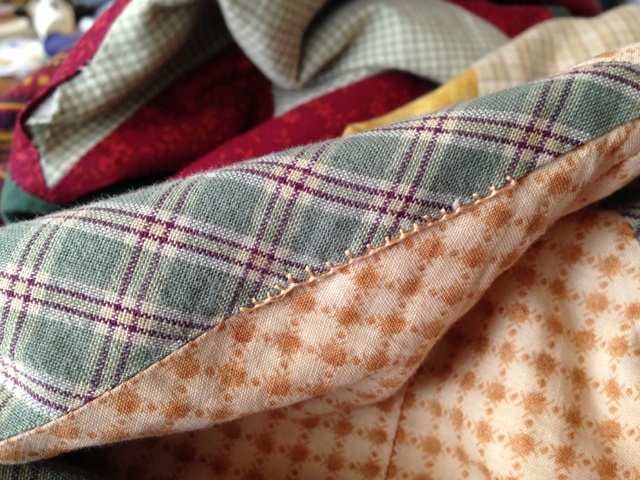 First of all thanks for the inspiration to use the buttonhole stitch to mend a quilt,we have a much loved quilt here too that will soon need some loving repairs made. And then this post reminded me of something I have been pondering lately,Japanese Wabi Sabi which is about finding the beauty in things that are worn and aged. There's a lot of beauty in a much loved quilt,all of the cozy moments,the good times and the love it was made with all soaked into it's worn seams.